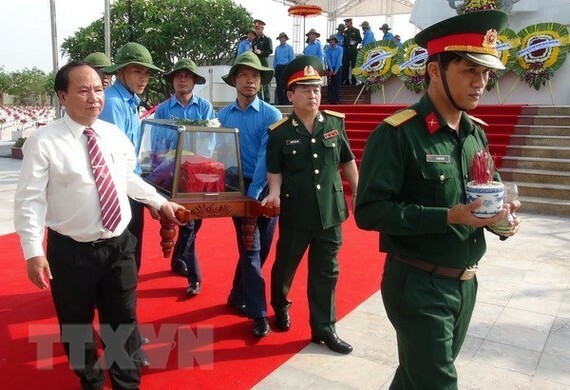 The People’s Committee of the central province of Quang Binh held a memorial and reburial ceremony on May 9 for 18 set of remains of Vietnamese voluntary soldiers and experts who laid down their lives in battlefields in Laos during wartime. The ceremony drew representatives of the Special Working Committees of the Lao Government and Khammoane province, Laos’ Ministry of Labour and Social Welfare, and leaders of the Military Zone 4 and Quang Binh province of Vietnam, among others. 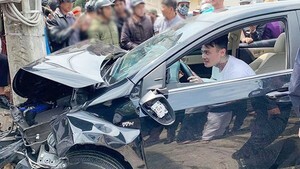 The sets of remains were searched and gathered by Team 589 under the Military Headquarters of Quang Binh province with the support from Khammoane province’s Labour and Social Welfare Department and Military Headquarters and Lao people. They were sent home in the first repatriation of this year during the 2017-2018 dry season. Participants at the ceremony offered flowers and incense to the martyrs, showing gratitude to the martyrs who sacrificed their live for the liberation of Laos. The remains were buried in Ba Doc Martyrs’ Cemetery in Dong Hoi city of Quang Binh. In May last year, Quang Binh also held a reburial ceremony for 26 sets of remains of Vietnamese soldiers and experts who died in Laos. They were unearthed during the 2016-2017 dry season.